And then it didn't. Auburn's Samir Doughty had fouled Guy on his attempt, sending Guy to the free-throw line with 0.6 seconds on the clock. Three free throws to right last year's wrong. Three free throws to avoid a meltdown that was happening in this game's final few minutes. "Pressure" does not come close to describing what it feels like to step to the free-throw line and have to make three straight—including one after a timeout. There is no adjective, no metaphor, to describe what anyone in that situation feels. How shaky your hands are when the ball is bounced. How bulletproof your belief in yourself has to be. "I was terrified," Guy said. "But I had confidence in myself." 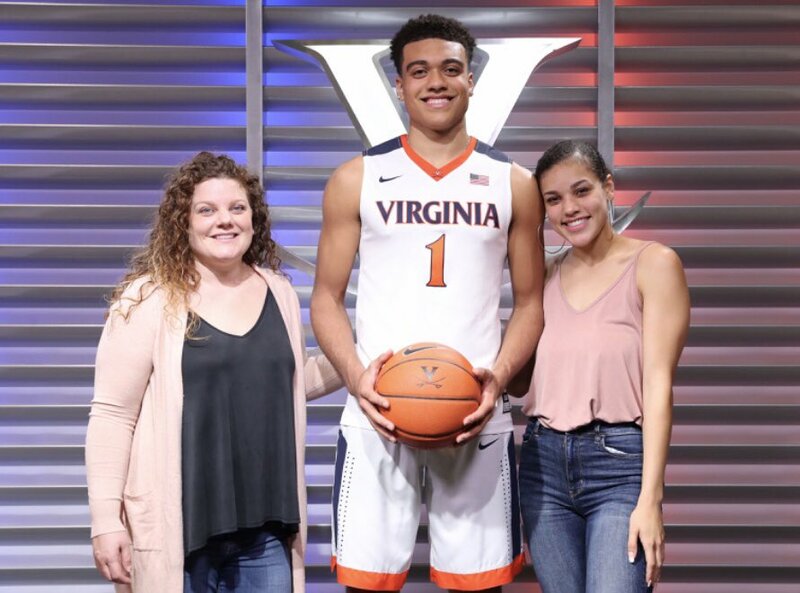 He calmly hit all three to win the game that many did not believe Virginia should have won. The boos howled throughout U.S. Bank Stadium long after the ball left Guy's fingertips, and long after the buzzer sounded for Virginia, 63-62. "Controversial or not, we got the win," said Guy, who finished with 15 points and nailed a clutch three with 6.5 seconds left to pull the Cavaliers within one. The foul on Guy's shot wasn't the only source of controversy. Even those who firmly believe the referees made the correct call on that play have to concede that Virginia's Ty Jerome should have been whistled for a double dribble seconds earlier, which almost certainly would have given Auburn a victory. Tony Bennett, his coach, perhaps summed up the wild finish best: "Survive and advance. I guess that's taken on new meaning." He hit three clutch shots to give Auburn a two-point lead, clapping his hands after the third, turning to the crowd and yelling, "Let's go!" Auburn seemed like it would win. But lost in the shuffle of questions has been an earlier defeat. A loss that was painful and humiliating and instructive on its own: Virginia's 65-39 second-round loss to Florida in 2016-17. That game, Virginia couldn't buy a bucket. Florida couldn't stop making them, at one point going on a 21-0 run. "Not many people remember [that game]," Jerome said. "We've been embarrassed in March, and that gives us a little extra chip on our shoulder, some extra motivation. We just know how tough it is to play and succeed in this month. "So when you've been through battles, and you're battle-tested," Jerome said, "I think it's an advantage coming into March." Saturday, facing off against Auburn, Jerome had the advantage. No more embarrassment. His jumper with 5:24 left ballooned the Cavaliers' lead to 10. For most of the game, he had his way—even dribbled between his legs, took a bump in the lane and hit a (prayer) runner just before the shot clock was to expire midway through the second half. De'Andre Hunter chipped in 14. His steady play to start the second half seemed like a calming force for his teammates. And he cleaned up the glass, too. "They're athletic, and they're quick, but De'Andre really did the things we needed," Bennett said. The Cavaliers made their layups. Didn't force shots. Came off screens shoulder to shoulder. They just played solid basketball. "It's been a long journey," said Mamadi Diakite, who had a game-high five blocks. "[UMBC] was a learning experience. It was hard to digest for a few months. After that, we sort of got back to what Virginia does. We didn't worry about what was going on outside of the perimeter. We kept working." Just 9-of-31. At one point in the first half, Auburn was shooting 9 percent. Virginia's defense made every shot tough. Every look was contested. Often uncomfortable. Most of all, Virginia slowed Auburn. Didn't let the Tigers get into their transition-oriented style of basketball. "This will be a memorable game, and I'd like it to be remembered for a great game," said Bruce Pearl, Auburn's coach. Let's not remember this game because of how it ended. Let's remember two teams that played really hard that only had 13 turnovers combined, didn't shoot it very well because there was great defense." After the game, Bennett reflected on that Florida loss. He remembers huddling by his players with a few minutes left. "I huddled down by them. I said, 'This is going to change. It's OK, but take note of this. We're going to do this.'" And then, after the UMBC loss the following year, there was Bennett again, reassuring his guys to stay the course: "We need to go through this, and we need to go through next year together. We need each other." Even if Guy had not knocked down his free throws, even if Virginia had lost on Saturday, Bennett's message would've been the same: "I would have been so thankful for what they've done for this program and our bond through this all."